Gerald R. Beasley received his bachelor's degree from Pembroke College, Oxford University, in 1982, and a master's degree in English language and literature from Oxford. He also has a master’s degree in library studies from the School of Library, Archive and Information Studies at University College in London. 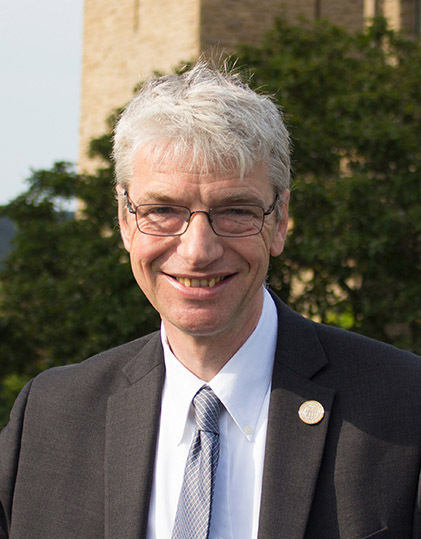 Prior to coming to Cornell as the 12th university librarian in 2017, Beasley served as the vice provost and chief librarian at the University of Alberta, Edmonton, where he oversaw eight public service libraries on three campuses as well as the University Archives, Press, Bookstores, Museums and Collections Services, Copyright Office and Technology Training Centre. He was the university librarian of Concordia University in Montreal from 2008 to 2013. Beasley served as director of the Avery Architectural and Fine Arts Library at Columbia University from 2004 to 2008, and at the Centre Canadien d’Architecture/Canadian Centre for Architecture in Montreal he rose from cataloguer, in 1994, to head librarian and associate chief curator, from 1999 to 2004. He also served as editor of the Early Works Catalogue at the British Architectural Library, Royal Institute of British Architects in London, from 1987 to 1991. He started his career as a trainee at the Bodleian Library at Oxford, and was an assistant curator at the Wellcome Library in London’s Wellcome Institute for the History of Medicine from 1991 to 1994. Beasley’s research interests include open access, diversity and information evaluation, and he frequently presents and publishes internationally on those topics. He is the co-author or editor of three books, including the award-winning “Early Printed Books 1478-1840: Catalogue of the British Architectural Library Early Imprints Collection,” as well as numerous articles. He has been the recipient of awards including the Outstanding Contribution to Student Life Award, from the Concordia Council on Student Life, and the Concordia Sustainable Champions Award, from Sustainable Concordia, both in 2011. He has taken an active leadership role in international professional organizations, and is currently the vice chair of the Association of Research Libraries’ Diversity and Inclusion Committee and past president of the Canadian Association of Research Libraries. He also serves on the New Review of Academic Librarianship’s Editorial Board, and the International Federation of Library Associations and Institutions’ Academic and Research Libraries’ Standing Committee. As the chief academic and administrative officer of the university's extensive library system, Beasley leads one of the world's largest research libraries, with a total budget of more than $64 million, a staff of more than 400 and more than 8 million print volumes, 1.5 million ebooks and 128,000 serials. Cornell has 18 constituent libraries located in Ithaca and New York City. The staff supports teaching, learning and research across the university’s colleges and schools, and it actively serves scholars around the globe.